V-1 of 'Doodlebug' Flying Bombs commenced targetting England in June 1944, a few days after D-day, and continued until the Pas-De-Calais area containing the launch ramp sites, was captured by the Allies in September 1944. Thereafter the longer range V-2 Rockets were deployed. A Bomb Census was conducted in each region to record the order in which bombs fell, the location, what caused them to fall short of London, and the damage sustained to casualties, livestock, property and infrastructure. 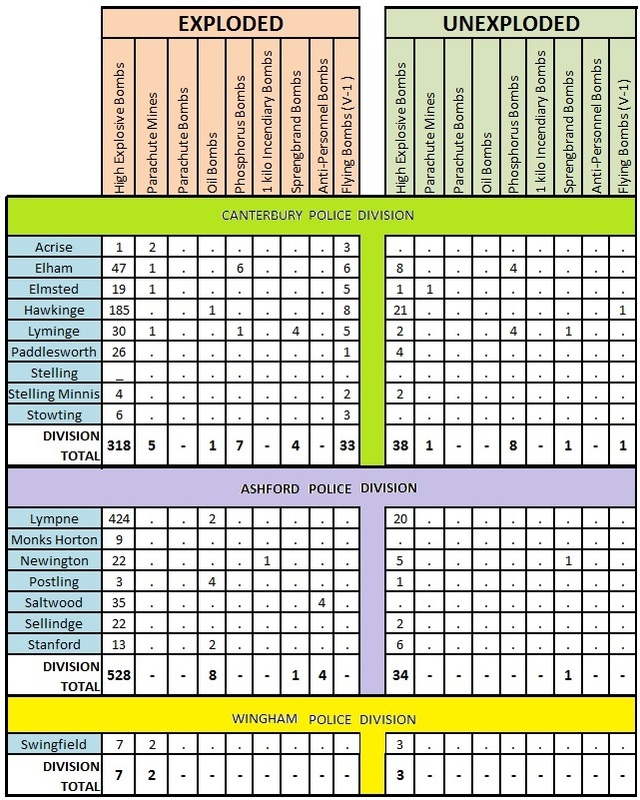 The following table records the incidents in the Elham District. Field near Terlingham, Hawkinge. Shot down by fighters Damage to two cottages and crops. No casualties. In open near Hedgecock Wood, Stowting. Shot down by night fighters No casualties. Damage to Yew Tree Farm, Lymbridge green, and Fair View. Hodiford Farm, Sellindge unknown No casualties. Consderable damage to Hodiford Farmhouse & buildings. Slight damage to The Windmill, Stone Hill, and Moorstock Cottage. 10 sheep killed, 5 injured. Field, Upper Otterpool Farm, Lympne Shot down by fighter No casualties. 3 Service huts destroyed. Slight damage to Red house, Newingreen & Mrs Marsh's house next door:also to 5 Oak Cottage, Barrow Hill, Sellindge. Mid-air over Horton Park Shot down by fighter No casualties. Sheep injured. Damage to wndow Hayton Manor. Over Kiln Wood, Saltwood Shot down by fighter No civilian casualties. 12 Military casualties (2 serious). Slight damage to several properties. Over Prince of Wales, Rhodes Minnis Shot down by fighter 13 Casualties (1 hospital case). 20 people homeless. Rest Centre, Elham opened. Road blocked. Extensive damage to property. 10 houses severely damaged. 55 houses slightly or moderately. Telephone wires damaged. Lymbridge green, Stowtin Shot down by fighter No casualties. Slight damage to several houses. Evington Park, Elmsted. Shot down by fighter No casualties. Slight damage to about 20 houses. Mid-air over Oat Hill, Lympne. Shot down by fighter No casualties. Slight damage to 2 houses. 200yards South of Skeete Farm, Lyminge Shot down by fighter No casualties. Damage to Skeete House. Slight damage to 3 cottages at Woodlands. 2 horses killed, 1 injured on Skeete Farm. Mid-air over Mill Down, Elham Shot down by fighter No casualties. Damage to approximately 12 houses, mostly slight. The Vicarage, Postling Shot down by fighter No casualties. Slight damage to several houses. Telephone wires cut. Postling Road blocked. Mid-air half way down Beechborough Hill Shot down by fighter 2 casualties - one serious. 4 cottages seriously damaged (3 of them evacuated.)N.F.S. Called in to extinguish burning trees. Acrise Wood, Acrise Shot down by Anti-Aircraft gun fire No casualties. Slight damage to 2 houses. Rear of Council Houses, Stone Street, Lympne Damaged by Anti-aircraft fire out at sea & crashed Civilian casualties 7 of which 2 hospital cases, other 5 slight. Service casualties 1 dead, 4 serious, 3 hospital, 10 slight. Several RAF huts & tents destroyed. Extensive damage to roofs, windows etc of about 20 houses. Chalk Pit, Newington Shot down by Anti-Aircraft gun fire No casualties. Considerable damage to property. Telephone wires cut. Newington to Arpinge road blocked. Slight damage to 30 houses. Home Farm, Sandling Damaged by Anti-aircraft fire and crashed One slight casualty (cut thumb). Extensive damage to Home Farm and out-building and 5 adjacent houses. Number of other houses damaged including Sandling junction station. One additional slight casualty. Field West of Aldergate Wood, Court-at-Street, Lympne Shot down by fighter Extensive damage to French House, several others slightly damaged. One slight casualty. Burnt Rough, Park Wood, Stelling Minnis Shot down by fighter No casualties. Slight damage to several houses. Thorne Wood, Saltwood. Damaged by gun fire & crashed No casualties. Damage to Bluehouse Farm, outbuildings and crops. Stone Farm, Saltwood, East end of Saltwood Tunnel. Damaged by Anti-aircraft gunfire and crashed on bank over the tunnel No casualties. Down line blocked. Southern Railway's Telephone lines cut. Damage to Stone Farm, Stone Cottages and Bargrove Cottages. Cornfield, Dane Farm, Stanford Shot down by Anti-Aircraft gun fire No casualties. Damage to several houses including Mrs Andrews' in Elvington Lane, Dane Farm House, Little Dane Farm, Sunny Bank, Channel View. Oatfield, Hope Farm, Stanford Shot down by Anti-Aircraft gun fire No casualties. Damage to six houses, including Hope Farm & Cottages, The Elms, Brook Farm, Hayton Manor. North West Gibraltar, Hawkinge on field under control of RAF Aerodrome Shot down by Anti-Aircraft gun fire 2 RAF personnel & 3 cows slightly injured. 3 small RAF buildings seriously damaged, one other slightly damaged. 1 civilian house slightly damaged. South East of French House, Lympne Shot down by Anti-Aircraft gun fire No casualties or damage. Kedward's Bakery, Stone Hill, Sellindge Shot down by Anti-Aircraft gun fire 3 serious, 3 slight casualties: all removed to Willesborough Hospital. 2 houses partially demolished. Large number of other houses damaged, 3 of which were temporarily evacuated. Clover field, Little Pett Bottom, Elmsted. Shot down by fighter No casualties. Damage to about 4 houses, including Little Pett Bottom and houses on Whatsole Street. Lympne Park Wood Shot down by Anti-Aircraft gun fire & exploded on ground 2 slight Military Casualties. Damage to several properties, including the Castle Stores. The Firs Farm, Hawkinge Shot down by Anti-Aircraft gunfire No Casualties or damage. 2 dwellings (7 people) evacuated and several minor roads closed. Beerforstal Farm, Elham Shot down by Anti-Aircraft gunfire Two slight casualties. Beerforstal Farm House & Barn, ceiling, roof & 1 wall. Wick Farm roof. Water Pumping Station roof. Mid-air over Aldergate Wood, Lympne Shot down by Anti-Aircraft gunfire No casualties or damage. Rear of Mount Pleasant Farm, Stanford Shot down by Anti-Aircraft gunfire No Casualties. Damage to Farm & several other houses. 6 sheep killed. Near Gills Poultry Farm, Newingreen Exploded in mid-air by Anti-Aircraft gunfire No Casualties. Considerable damage to houses in vicinity- mainly tiles dislodged, windows broken and ceilings down. Approx 12 houses. Mid-air over small wood on Dane Farm, Hawkinge Exploded in mid-air by Anti-Aircraft gunfire No Casualties. Slight damage to 4 houses. Dane Farm Considerably damaged. 200 yards South East of Postling Church, bomb fell in 2 pieces. The propelling unit approx 1½ miles away towards the Farthing, War head near Postling Church. Shot down by Anti-Aircraft gunfire 2 slight Casualties. Extensive damage to property, necessitating the evacuation of 3 families. War-head in Stowting Rough Wood MR:571.614, Fuselage in West Wood, Lyminge MR:575.614 Shot down by Anti-Aircraft gunfire No Casualties and no damage. Crater 31 feet x 11 feet. Excellent specimens of Compass, Gyroscope etc picked up in West wood, which detached themselves before war head exploded. C.C. Fly, Winterdown Farm,Elham MR:642.621 Probably shot down by Anti-Aircraft gunfire No Casualties. Farm House damaged. Ridge Row Acrise MR:643.598 Shot down by Anti-Aircraft gunfire very small crater. One woman slightly injured (bruises) Approx 30 houses slightly damaged, 2 severely. 7 occupants evacuated. Road slightly damaged. Telephone wires cut. In trees Ottinge Court, Elham MR:607.602 Shot down by fighter. C.C. Fly. No crater No Casualties. Elham Valley Rail line covered with debris. About 20 houses and farm buildings damaged, including Ottinge Court, Gammon's Farm. Cornfield behind Institution, Etchinghill, Lyminge MR:599.572 Shot down by Anti-Aircraft gunfire Crater 15 feet x 10 feet. No Casualties. About 20 houses damaged, 3 in Westfield Lane badly. No evacuation. Cuckoo Lane, Postling MR:589.566 Shot down by Anti-Aircraft gunfire. C.C. Fly. Crater 20 feet x 10 feet No Casualties. Slight damage to houses. Road blocked by trees, Telephone wires cut. Evington Lease, Elmstedn MR:539.635	 Shot down by fighter	 No Casualties. Damage to about 20 houses, including some in Ashford area. Evington Lease badly damaged. No evacuation necessary. Mid-air over White Hall Farm, Paddlesworth MR:637.577	 Exploded in air by Anti-Aircraft gunfire	 No casualties. Slight damage to 3 houses, including White Hall Farm, and the Red Lion. Gaylees Farm, Stelling Minnis, MR:577.650	 Damaged by Anti-Aircraft gunfire and crashed. Crater 10 feet x 9 feet. 2 Slight Casualties. Slight damage to about 15 houses. Fir Tree Farm, Rhodes Minnis, Elham MR:593.613	 Damaged by Anti-Aircraft gunfire and crashed. C.C. Fly. 1 slight Casualty. Extensive damage to Fir Tree Farm. Slight damage to several others. Whatsole Street Farm, Elmsted MR:555.624	 Damaged by Anti-Aircraft gunfire and crashed. Crater 12 feet by 3 feet. C.C. Fly. No 701303	 No Casualties. 1 sheep injured. Extensive damage to 3 small holdings and farm buildings. No evacuation necessary. Slight damage to 3 or 4 houses. Methodist Church and Hall, Church Road, Lymnge MR:601.593	 Damaged by Anti-Aircraft gunfire and crashed. C.C. Fly. 9 Slight Casualties. No hospital cases. Church and Hall destroyed by fire. About 150 houses damaged: some serously. 7 families evacuated. Emergency feeding for about 50 people. Rest Centre opened for 2 families. Sir W. Wayland's house, Hempton Lodge, Monks Horton. MR:571.584	 Shot down by Anti-Aircraft gunfire	 3 Slight Casualties. Extensive damage to 2 houses, including Hempton Lodge, slight damage to several others.